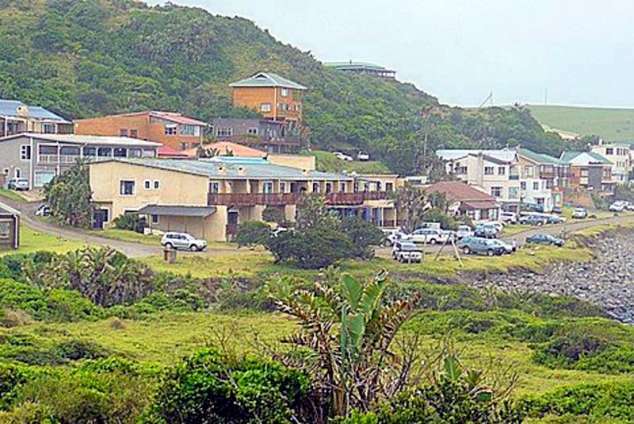 Mitford Lodge Unit A1 - Morgan's Bay Accommodation. Discover one of the best kept secrets of South Africa which is now easily accessible thanks to a new tar road. Morgan Bay is approximately 80 Km from East London (some 45 minutes drive). The Unit is situated 35metres from the sea with the most stunning view of the famous Krantzes, The apartment accommodates a maximum of Six people. It comprises three furnished bedrooms (one en-suite) and a separate bathroom with bath and shower. The living area is a spacious open plan Kitchen/ Dining room and lounge with a medium sized Fridge, Stove and Oven, Microwave and all essential utensils. The open air balcony has a braai and you will be sitting 35m from the explosive sea at high tide. The main (en-suite) bedroom is also directly sea facing, whilst the second and third bedrooms face the Krantzes. Under cover parking (Carport) is situated next to the unit. Linen and bath towels are provided and maid services (if required) can be arranged with the housekeeper / agent. Please don't forget to bring your own BEACH towels. All you need to do is sit on the balcony in whale spotting season (or if energetic, walk up the Krantzes and enjoy the endless uninterrupted view). You can drive up the Krantzes, but it is an unwritten rule to do so with caution as this is part of a green belt. Dolphins are regular visitors to the bay. The Lodge itself has a bar and a restaurant at affordable prices and Morgans Bay hotel which is 600m away offers similar facilities. The popular Morgans bay beach is only 5 minutes walk away with safe paddling for toddlers in the lagoon area. Nearby is the Great Kei River mouth (5km) which boasts picnic areas, motor boat launching facilities, skiing and is particularly enjoyable for the entire family with relatively safe swimming areas for young children. Kei Mouth also has a variety of restaurants and pubs with various facilities and entertainment (particularly in holiday season). Walks or hikes - the possibilities are almost endless and there is a "Strandloper trail" for the enthusiast (4 Day walk). Horse rides every morning and afternoon Double Mouth reserve with the most amazing beaches tidal pools and "Double lagoon"
Sundowners high up on the Krantzes. Golf (Kei Mouth Golf Club - a 12 hole course) is 4 Km away and playing and visitors fees are minimal. 16547 page views since 15 Apr, 2009. Last updated on 15 May, 2018.